Today was kinda awesome. I went to Milwaukee for work, landed some new business, had a great banh mi at this vietnamese joint, camped out at a coffee shop with a matcha green tea almond milk latte, got a new pair of sneakers at the Nike outlet, had a good workout, and finished the day with this meal. Oh yeah. The sneakers I got were these polka-dot Nike Hyperfr3sh for 37 bucks, score! 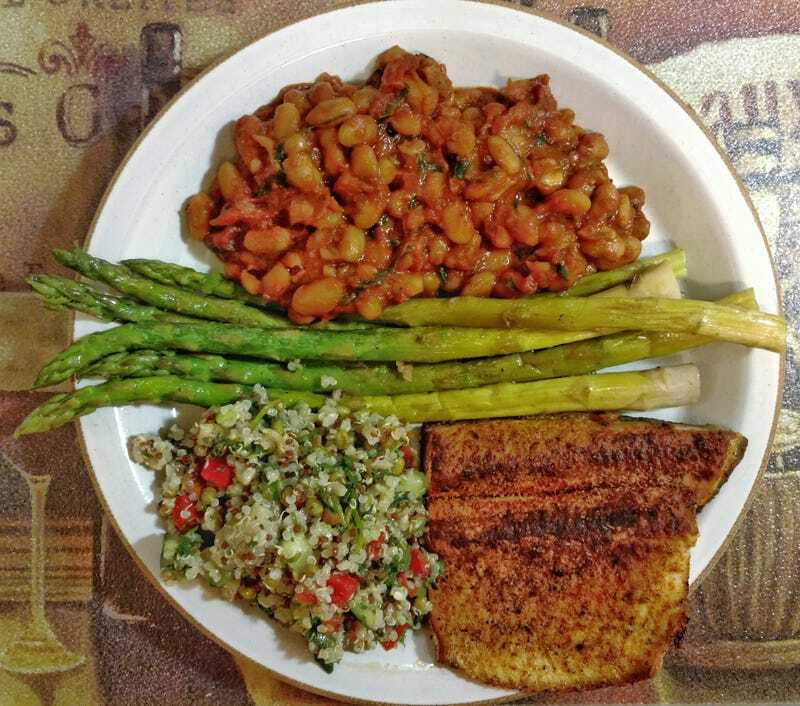 My post-workout meal was rainbow trout, quinoa salad, asparagus, and my tuscan white beans with roasted marinara sauce that are ahhhmazing. The quinoa salad is from the Costco deli but hey, it’s pretty damn good, and purty looking. I’m a happy meathead right now.